I’m very blessed to have a husband who remembers our wedding anniversary. If it wasn’t for him reminding me I think I’d forget every year! This year is 7 years for us. A great year because traditionally the gift given is wool… and this is what he chose for me! A lovely textured alpaca yarn with a chainette construction. I am one happy wife! The puff stitch flowers work well with this yarn as it is nice and lofty thanks to the chainette twist. I used exactly one skein of yarn, so this is great for a single skein project. The flowers in the pattern are made using 6 puff stitches. Petals 1-4 are made in one row of the pattern, and then petals 5 and 6 are made in the following row. The whole flower uses 4 stitches from the row below. 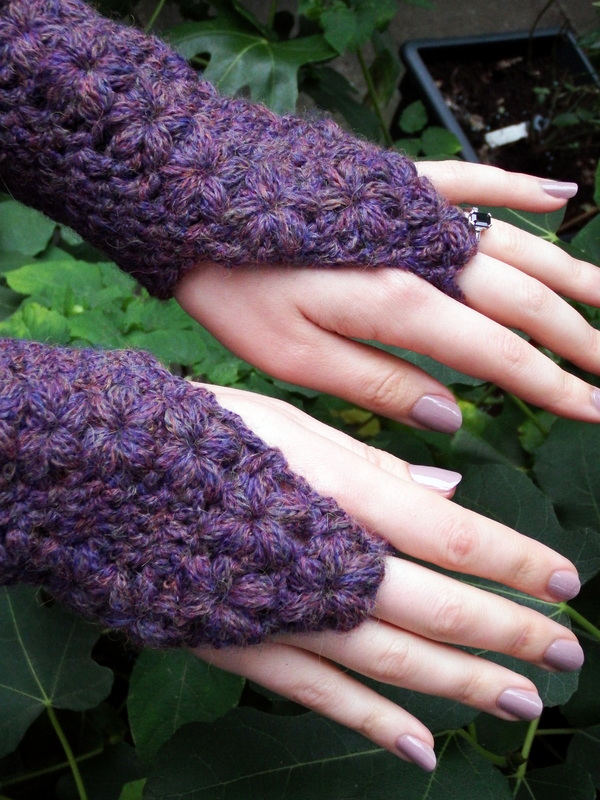 I’m going to be making a video tutorial on how to do this stitch next week – so don’t be afraid of trying these out! If you prefer a puffier petal, just add more yarn overs. 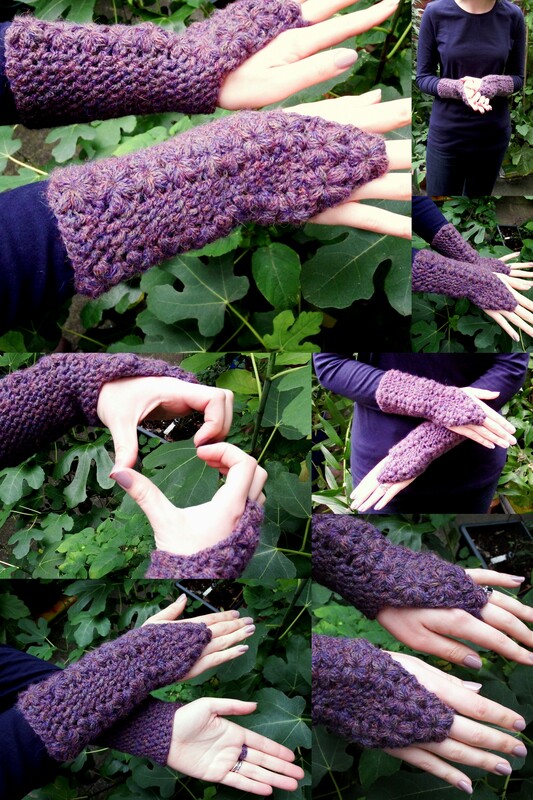 The gloves are worked in one piece, in the round from the arm to wrist, and then in rows from wrist to finger loop. You can adjust the size to suit your arms by adding or subtracting any amount from the foundation chain – the back is plain double crochet so these could go right up your arms if you wanted – just work some decreases in the plain section to keep them fitted! Ch2 at the start of the round counts as a dc – ch3 if you prefer. Fsc 30 and join with a sl-st to work in the round (12sts will be used for the flower trails and 18sts will be the sides and back of the tube). R1: ch2 , dc in next st. Make the first 4 puff petals (see instructions above), dc 4 times, make the second set of 4 puff petals, dc in each of the next 16sts, join with a sl-st into starting ch (22 dc’s and 2 sets of 4 petals). R2: ch2, dc in next st, make the 5th and 6th puff petals as described above, dc 4 times, make the 5th and 6th puff petals of the second flower, dc 16 times, join with a sl-st (22 dc’s and 2 completed flowers). R3: repeat R1, but when you make the 2nd and 3rd petals, insert the hook into the ch made to secure the 5th and 6th petals made in the row below respectively. Repeat rounds 2 and 3 3 more times – you will have made a tube 4 and a half flowers tall – or do as many repeats as you prefer until you get to just before the wrist. We will now be narrowing the tube for the wrist by decreasing in between the flowers. R4: ch2, dc in next st, make the 5th and 6th puff petals as described above, dc2tog twice, make the 5th and 6th puff petals of the second flower, dc 16 times, join with a sl-st (18 dc’s and 2 completed flowers separated by two dc2tog sts). R6: Repeat R2, but only work 2 dc’s in between the flower sts (20 dc’s and 2 completed flowers). R7: Repeat R5, but work 2dc into each of the two dc between the flowers (22 dc’s and 2 sets of 4 petals). The tube is now complete. We will now be working the hand cover in rows. R14: ch2, turn, work the 5th and 6th petals of the flower as usual, dc in final st (2dc, 1 complete flower). Make the finger chain: Insert hook into the bar of the dc just made and draw up a loop (two loops on hook. Ch1 through the first loop and then yarn over, draw through both loops on hook. This makes the first fsc st for the finger loop. Make 5 more fsc sts (or required amount for your finger) and join to the dc on the other side of the final flower with a slip st. Fasten off and use the tail to attach the chain of the fsc sts into the same st. Thank you Jen! I hope you have fun making it! Thank you! I’m enjoying wearing them already. Even though it’s not quite cold enough yet! Thanks! I may have to buy more of this. 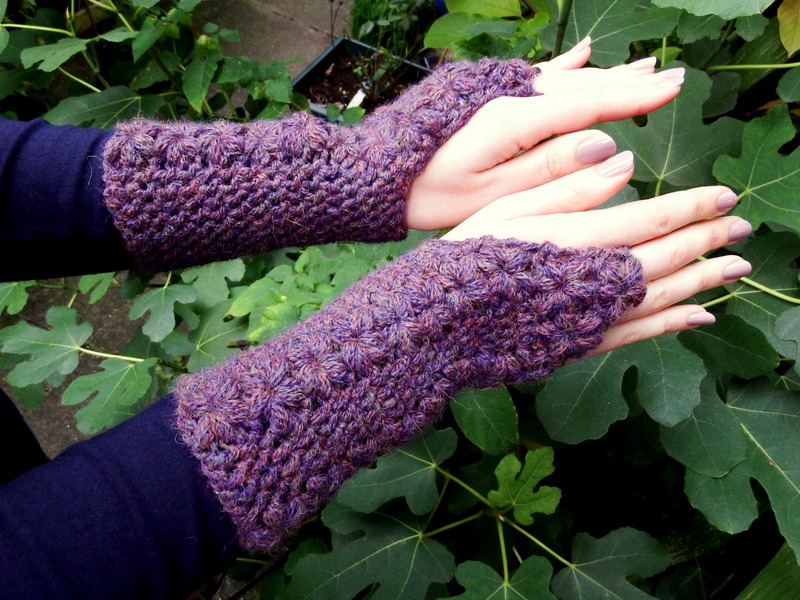 Chainette yarn is nice to crochet with as it doesn’t untwist!